Welcome back, guys! March certainly flew by didn't it? But then again, when does a month ever go by slowly? 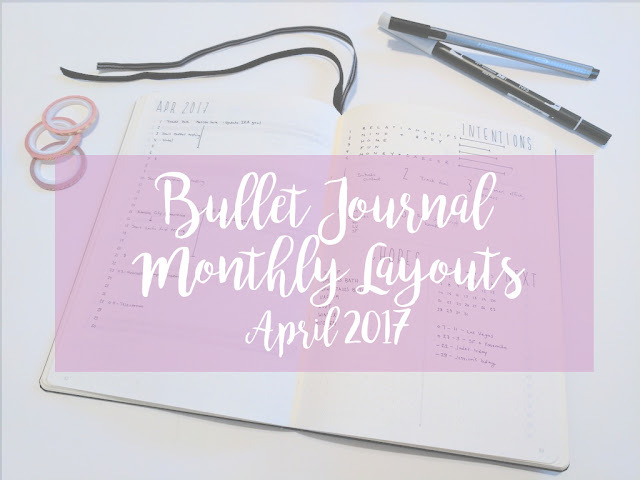 Anyway, I spent some time this last weekend reviewing last month's layouts and creating my April Bullet Journal monthly layouts. As always, I'm excited to share them with you and talk a bit about my ever-evolving planning process! I know I've been waxing poetic about my calendar grid layout as my monthly overview for the last view months now (ok maybe a bit more than a few months.). So why in the world am I back to a single page vertical layout this month? Well, sometimes you've got to stare at your Pop-Tart and decide if you still love it. Basically, it all comes back to intention. Since you're reading this post, I'm going to assume you're already pretty interested in creating a examined life for yourself. You care about planning ahead, organization and personal development. You spend a lot of time coming up with ways to organize all the various facets of life. But then what happens once you've come up with an a good system? A lot of times, the examining stops there. For Lorelai in Gilmore Girls, she reaches for a Pop-Tart every day, and she has for years. Then one day she realizes she's not even sure if she *likes* Pop-Tarts. This month, I'm staring at my metaphorical Pop-Tart. 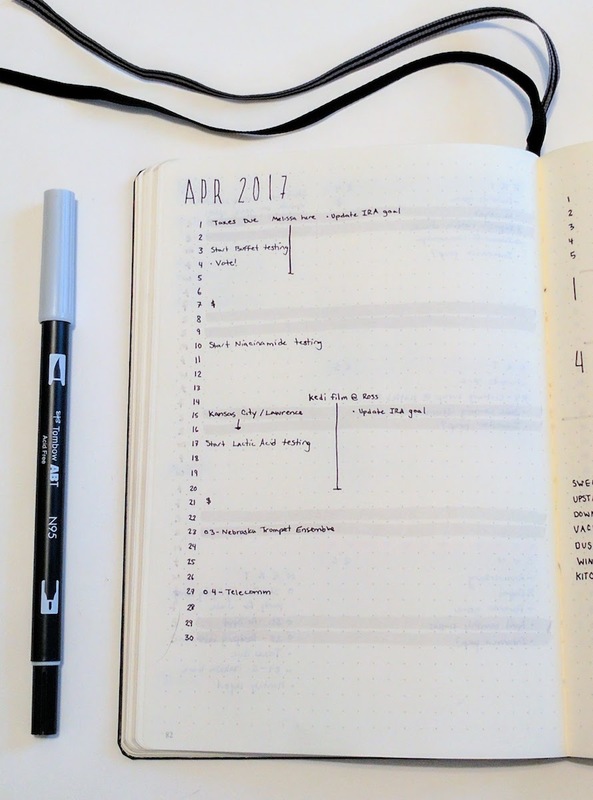 Because my monthly overview is only a single page, I don't have any room there for things I was squeezing onto my old grid view. Queue this multipurpose spread! I've crammed goal setting, chore tracking and future planning all into a single layout. As I've been doing each month, I reassess where I feel like I'm at with my modified Level 10 Life categories. This month I'm explicitly setting a goal in each category below my self-assessment. These monthly goals directly relate to my yearly goals and I plan to set a mini-goal each day of April that corresponds to one of these monthly goals. This way I'll always keep those big goals in my mind's eye! 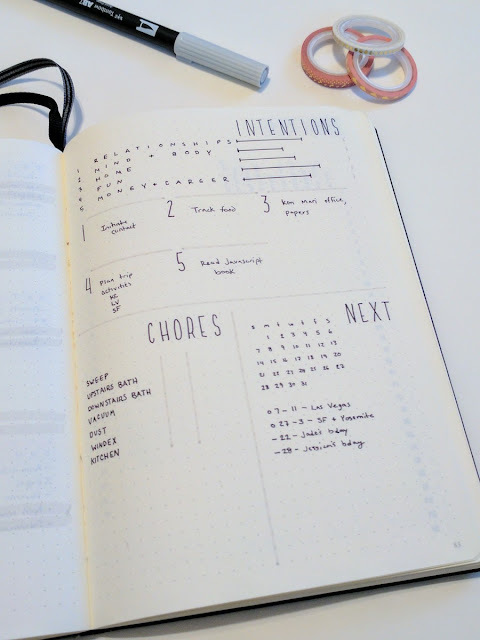 The next part of this spread is a small chore tracker. 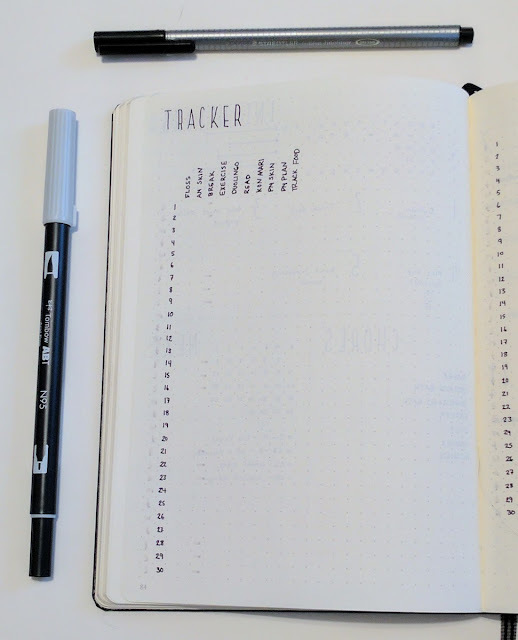 This month I ditched the chore tracker I had been using entirely! I decided that a lot of the chores I had originally scheduled as once a week were actually quite fine to do once monthly. In fact, there were only three chores I deemed necessary to repeat every week, so I moved those to my weekly view. The rest of the chores will live here and I'll mark them off with the date as they're completed throughout the month. (P.S. - If you're curious about how I set up my cleaning schedule, I explain all of that here). There was only some small change to my tracker that month. I whittled down my habit list in an effort to focus on one "Wildly Important" new goal at a time. Once I've successfully made this new habit, I'll a a new one, but continue to track the successfully formed habits. 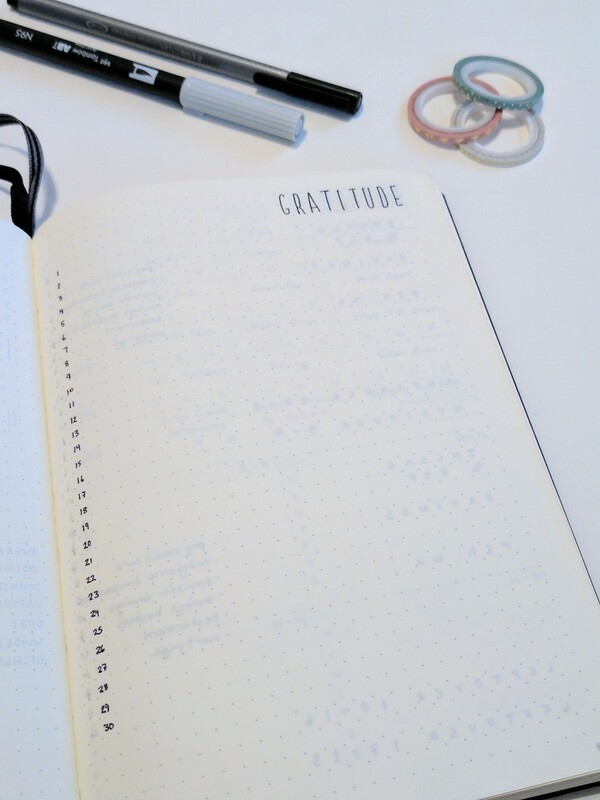 Last month I spent some time organizing the habits by group. When I did this I added a space between each group. It turns out that's really confusing when you're on the last few days of the month. Bye bye extra space! This one also stayed the same this month, after some minor tweaks I made last month. If you want a better explanation of my budgeting and money management, you can read all about that here. This spread is a result of some consolidation after reviewing last month's meal planning and workout layouts, and a new workout plan starting in April. I was doing Kayla Itsines's Bikini Body Guide circuits for the first 12 weeks of the year, but after completing that for the 3rd time, I decided to focus back on weight lifting routine for a bit. My weight lifting plan shown here will get me through 3 weeks with only a single set of exercises. 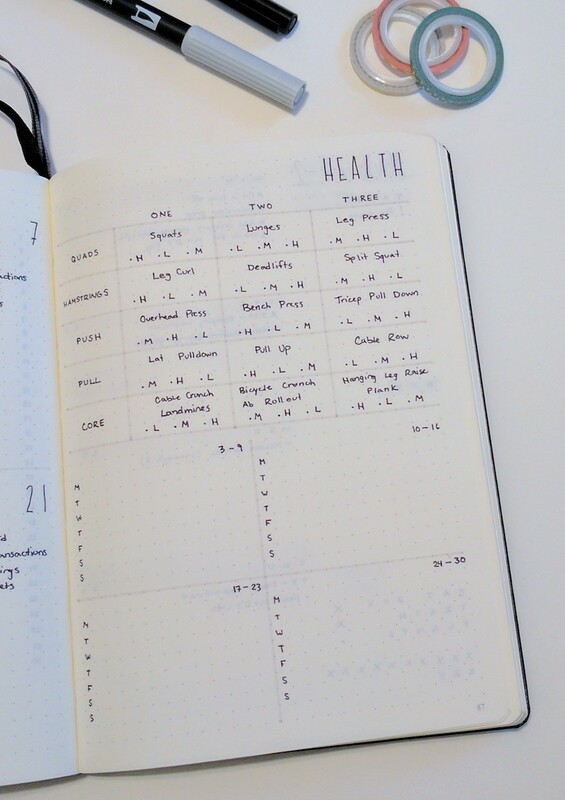 I'll be able to see each routine, check the days off and write down the weights, all in one space! If you'd like to see more on how I plan my weight lifting routines, or even just my workouts in general, leave me a comment below! 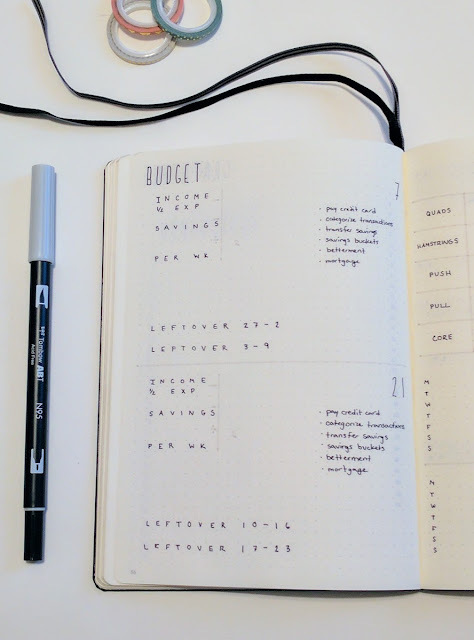 The bottom half of this spread is for meal planning. I didn't really need a huge space to plan out dinners and the lunch I meal prep for the whole week, so I'm experimenting with squishing all four weeks into a half page layout. We'll see how it goes! Well, that's it for April! I hope you guys have enjoyed learning a bit about my decision making process for each layout. If you have any ideas you'd like to share, please leave a comment below! I'd love to hear what you're doing.